Whether it’s because of a get together with family and friends or just a quiet evening outside, during the summer months most of us will want to spend even more time than usual in our beautiful yards and gardens. Unfortunately, so will many bugs – especially mosquitos. 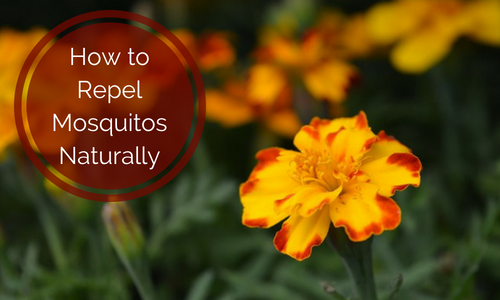 Though many people rely on bug spray to keep pesky mosquitos away, they may be unaware that there are various natural alternatives that repel bugs and can also enhance the look of your yard. Not only is standing water in your yard a real eyesore, it’s a perfect place for mosquitos to breed. As matter of fact, most of a mosquito’s life cycle, from egg to emerging adult, occurs in the water. So, if you’re looking to repel those troublesome insects, getting rid of as much standing water in your yard as possible is the way to start. How you choose to get rid of standing water in your yard is going to rely on what issue is causing water to accumulate. One common cause of standing water is grading. A graded lawn should be properly leveled to allow water to drain away from the house towards a proper drainage area. Regrading your yard involves consulting a landscaping professional and having them survey the property in order to identify the low stops in the yard. The landscaper would then plan slopes that would have the water soak into the soil, run off to a proper drainage area, or a combination of both. Another common issue that causes standing water is thatching. Thatch is a layer of organic matter (usually dead leaves, roots, and stems) that block soil from properly absorbing water. There are two primary ways to deal with thatch in your yard. The first is a process called dethatching which involves using a dethatching machine. A detaching machine breaks up the thatch using vertical blades so it can then be removed (raked) easily. The second method of dealing with thatch is through lawn aeration. Aerating a lawn involves using a specialized machine to punch holes in the soil to loosen it. This allows the soil to breathe easily allowing nutrients, oxygen, and water into your lawn. To keep your lawn looking sharp year-round, we recommend that you aerate your lawn at least once year – especially if your lawn is walked on or used often as this compacts the soil more. In addition to grading, dethatching, and aeration, installing a French Drain is a great, inexpensive, and relatively easy solution for eliminating standing water. A French Drain is made of plastic pipe with perforated holes in it, this is wrapped in landscape cloth, which will prevent soil and other debris form clogging the pipe. The wrapped pipe is then laid in a trench on a bed of gravel. This is then coved with gravel, soil, and then grass. How deep you dig the trench for the pipe will rely on where you’re planning on laying the pipe. For example, if it will be laid close your home you’ll want to lay it deeper (6 – 12 feet) in order to protect the foundation and basement of your home. If your French Drain will be laid father away from the home 2 feet maybe enough to solve your standing water issues. Feeling overhwhelmed by these options? Don't worry, our team of landscaping professionals can help - just give us a call. Sometimes you’re going to want a solution for repelling mosquitos naturally that is more than just eliminating an eyesore. That is where bug repelling plants come in. Plants are a great solution because they enhance the beauty of yard while still providing practical comfort for you and your guests. There are many plants that repel mosquitos such as catnip, ageratums, and lemon grass. These plants are usually aromatic, so the plants you choose are going to be based largely on your preference of smells and what’s going to look best in your yard. Ageratums are beautiful and repel mosquitos! The most popular and perhaps the most well-known plant that repels mosquitos is Citronella. Citronella produces oils that are often used in natural mosquito repellants, essential oils, and candles. It has a strong yet pleasant smell that is often described as grassy or floral. Lavender is an often-overlooked mosquito repelling plant that smells great and produces beautiful purple flowers. Once established, lavender is a tough plant that tends to do very well and is drought resistant. Marigolds are another plant that repels mosquitos and produces beautiful yellow or orange flowers. In addition to grasses and floral plants, many herbs such as rosemary, basil, and mint not only help to repel mosquitos, but can also be used to make delicious meals or even refreshing drinks! Whether you’re using grass, flowers, herbs, or a combination, you’re going to want to plant your mosquito repelling plants close to areas that you know may collect standing water. This will help dissuade mosquitos from using that water as a place to breed. Some floral plants (like marigolds) and most grasses are good plants for this. In addition to places you know standing water may collect, placing plants close to areas where entertaining will take place is a great idea. This way your guests won’t have to deal with pesky mosquitos’ bites or covering themselves in DEET when they should be having fun. Plants that will be around or in areas for entertaining can either be planted alongside the area directly in the lawn or can be potted and placed within an area or even moved as needed!